"CRIME STATS are nothing to write home about … our emphasis is what should to be done‚ rather than the crime stats … the example I have all the time is it doesn’t matter what figures you put‚ if you cannot deal with murder cases it will not bring any joy to South Africans … on average 57 people are murdered a day‚ which brings us close to a war zone … yet we are not in war‚" pointed out worried Bheki Cele, minister of Police at Parliament. SA a war-zone, says Police Minister Bheki Cele during SAPS yearly crime stats in Parliament. Presenting the yearly South African Police crime stats, Cele and counterparts indicated that crime was high, specifically on murders including taxi violence, gang related violence, mob justice and cash-in-transit heists. “The answer we must give is what should be done … never again will we come to give such statistics … it cannot be that South Africans are put under such fear‚ stress‚” says Ndosi, Cele’s clan name in his traditional hat. Western Cape police stations recorded the highest number of murder reports‚ followed by those in Gauteng. In 2017-2018‚ 20 336 murders were recorded‚ 1 320 more than in the previous financial year. This translates to an average of 57 people murdered every day‚ up from an average of 52 people in 2016-2017, indicated head of police crime research and statistics‚ Maj-Gen Norman Sekhukhune. More than 50 100 sexual offences were reported in the 2017-2018 financial year‚ up from about 49 700 in the previous year. Reports of cash-in-transit heists were also on an upward trend: 238 such cases were recorded in the current financial year up from 152 in 2016-2017. Police committee chair Francois Beukman said the increase in the murder rate was “alarming and unacceptable”. Cele conceded there are not nearly enough officers to police the country’s ever-growing population. 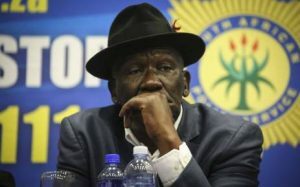 But Cele says funds have been released to ensure police colleges can take in more recruits to bolster the South African Police Service’s ranks. Various community organizations, civil organizations, political parties and honest, hardworking citizens squarely blamed this phenomenon from the oversight of Government and private sector that should help in curbing crime in the country. Some pointed out with a grave concern that democracy has given illegal immigrants powers to do as they please. The question is what measures will be put into place to control crime, because it cannot be eradicated?